A research team from the University of California in San Diego, has successfully 3D-printed a tissue that resembles the complex structure and function of a human liver, which can be used for patient-specific drug screening and disease modeling. The study published in Proceedings of the National Academy of Sciences aims to fast-track the development and process of new life-saving drugs, saving pharmaceutical companies time and money in the process. How is 3D-Liver Tissue Created? The beginnings of this work can be found in Chen’s earlier study on Bio-inspired detoxification using 3D-printed hydrogel nanocomposites published in Nature Communications, where they came up with a 3D-printed device that mimics the liver’s ability to remove dangerous toxins from the blood. Called dynamic optical projection stereolithography (DOPsL), this biofabrication technology is able to produce the micro- and nanoscale resolution required to print tissues like blood vessels (which are remarkably complex). 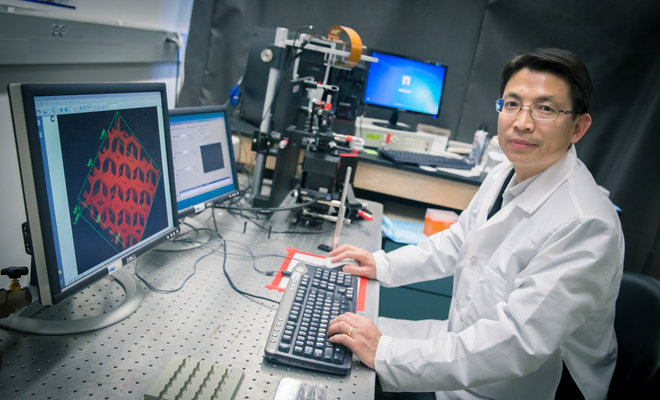 Using biofabrication, Chen and his team created the 3D-liver tissue by, first, printing a honeycomb pattern of 900-micrometer-sized hexagons, each containing liver cells derived from human induced pluripotent stem cells. Which allows researchers to build patient-specific drug screening platforms, without the need to extract any cells from the liver to build liver tissue. Then, they print endothelial and mesenchymal supporting cells in the spaces between the stem-cell-containing hexagons. “The liver is unique in that it receives a dual blood supply with different pressures and chemical constituents. Our model has the potential of reproducing this intricate blood supply system, thus providing unprecedented understanding of the complex coupling between circulation and metabolic functions of the liver in health and disease,” said Shu Chien, a professor of Medicine and Bioengineering, director of the Institute of Engineering in Medicine at UC San Diego and Chen’s colleague. With any luck, this will change the face of pharmaceuticals.